By author: Gould B. Hagler Jr.
GEORGIA'S CONFEDERATE MONUMENTS is the product of two decades of work, during which time the author has traveled throughout the state to photograph the memorials to the men and women of the Confederate States of America, to study their inscriptions, and to document information about their construction. The monuments are built in a variety of styles. The most typical monument is the statue on the town square. A close second is an obelisk in a cemetery or elsewhere, with a funereal design rather than a martial one. Next are the monuments honoring specific men or units. There are several monuments dedicated to the women of the Confederacy. In addition, the state is also graced with memorial walls, memorial stones, and the odd boulder, fountain, and arch—plus one Sigma Chi Cross, one lion, and one very tall chimney. GEORGIA'S CONFEDERATE MONUMENTS includes them all. These works of art and their eloquent inscriptions express a nation’s profound grief, praise the soldiers’ bravery and patriotism, and pay homage to the cause for which they fought. During my term of as governor of Georgia, the State and the Nation marked the Centennial of the Civil War and commemorated this central event in our history. After the passage of another half-century, in the Sesquicentennial, a new generation reflects upon the meaning of this epic struggle and the lessons its history teaches all Georgians and all Americans. GEORGIA'S CONFEDERATE MONUMENTS is a fine book which captures the beauty of the memorials and records the inspiring words engraved upon them. These monuments can now be enjoyed and studied by all. I commend Gould Hagler for his dedicated work in compiling a comprehensive, up-to-date book of photographs of Confederate statues and other memorials to the many loyal men of Georgia who struggled heroically in their quest for independence. Their devotion and sacrifice have been affectionately memorialized by the Ladies Memorial Associations, United Daughters of the Confederacy chapters, and Sons of Confederate Veterans camps throughout the state. Of special note are the newer monuments—approximately thirty in number—built in the last twenty years, with the most recent constructed in 2011 and 2012. After 150 years, interest in this era has not waned. 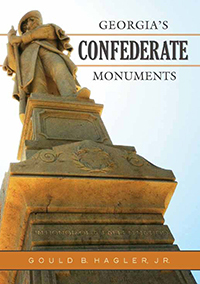 Georgia’s Confederate Monuments is a marvelous reference book for tourists, Civil War buffs, and people with a special interest and appreciation for remembering our nation's greatest crisis and the many tributes paid to the Georgians who fought so bravely.